This ambitious work seeks to set forth a new religious tradition characterized by its central concern for the fate of the planet. Seeking a postmodern, non-theistic response to the problems foisted upon the globe by rapacious human activity, Bron Taylor rejects the notion that standard theology can face up to the challenge of fixing the myriad stresses that currently imperil the Earth's ecosystems. Instead, he proposes a new sensory and sensible model that ensures sustainability without the trappings of religious structures and in situations. The sensory aspects of this new religion will connect people with the beauties of nature. The sensible aspects will embrace the new cosmological story, finding, as in the work of Thomas Berry, inspiration in the scientific narrative and hence reasons to embrace and enact the values of environmental ethics. In many ways, this book presents a tour de force overview of Taylor's three-decade entrancement with the environment, including stories of his work as an ocean lifeguard, his assessment of human-Earth intimacy as found in cinema, poetry and literature, and his advocacy for an Earth-friendly ethic. The opening segment of the book spells out the manifestations of this nascent faith, deemed as supernatural (spiritual animism and Gaian spirituality) and natural (naturalistic animism and Gaian naturalism). Taylor highlights Gary Snyder and Joanna Macy as exemplifying the spiritual approach, and Marc Bekoff, Jane Goodall and James Lovelock the nature approach. In the next section he profiles early pioneers in the field: Jean Jacques Rousseau, Edmund Burke, Henry David Thoreau and John Muir. Having established the philosophical and practical foundations of Earth advocacy, he then discusses contemporary North American radical environmentalism, opening with a gripping description of the suicide of William C. Rogers shortly after his arrest for acts of ecotage (ecologically harmful sabotage) that caused millions of dollars of damage to housing developments, automobile dealerships, logging companies and other facilities. He notes that the writings of Edward Abbey, Baird Callicott, John Seed, Vine Deloria, Donald Worster, Roderick Nash, Jeremy Rifkin, Vandana Shiva, Carolyn Merchant, along with many others, have helped to inspire a creed for this new radical movement, encapsulated by David Abram as the perception that "birds, trees, even rivers and stones begin to stand forth as living, communicative presences" (88). Taylor finds proof that dark green religion has arrived with two chapters, one on the culture of ocean surfing, the other on the representation of human-animal relationships in a variety of media, from Disney movies to the Discovery Channel. He explores in detail the work of David Suzuki, author and documentary filmmaker, noting the influence of Thomas Berry. The first six chapters of the book form the core of Taylor's argument and succeed admirably in making the case for the need for increased sensitivity to nature. The seventh chapter is more tentative. It attempts to anticipate objections to an Earth-based religious sensibility, setting forth arguments that it might be seen as naive, fascist and overstated, and that it could, as a form of Paganism, threaten not only traditional religions, but also the cherished anthropocentric notions that have allowed human dominance over the Earth. The penultimate chapter, "Terrapolitan Earth Religion," reports on the 2002 United Nations World Summit on Sustainable Development in Johannesburg, South Africa, with a special focus on the work of Al Gore and the Summit's non-ratification of the Earth Charter. The conclusion of the book reveals Taylor's intent as an educator and advocate for environmental ethics. He sees the knowledge base and principles of dark green religion as a viable substitute for adherence to an organized religious tradition. Because various Christian faiths have chosen not to embrace the Earth Charter on the grounds that it advocates women's reproductive rights and includes what seem to be Neopagan and pantheistic ideas, Taylor finds little prospect for traditional theology to become green. He criticizes the Parliament of World's Religions for not recognizing the Charter, yet acknowledges that the 2009 gathering of the Parliament in Melbourne, Australia took "Healing the Earth" as a primary theme. 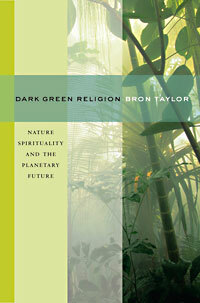 He ends with a fourfold assessment: radical environmentalists play an important role in consciousness-raising; environmental catastrophes will escalate; individuals will adopt the principles of dark green religion; and social mobilization will result in "the creation of environmentally sustainable and socially just lifeways" (218). Though one cannot dispute the basics of Taylor's argument it seems somewhat incomplete. He is evidently not aware of or interested in how members of organized faiths are embracing forms of green activism without rejecting their core religious beliefs. Christians, Buddhists, Muslims, Jews and Hindus have all been grappling with the in sights of science and, increasingly, have expressed dismay at the state of the planet. Starting more than a century ago, Teilhard de Chardin, D. T. Suzuki, Muhammed Iqbal, Abraham Heschel, Sri Aurobindo and Mahatma Gandhi all set forth ideas for how religions can adapt to modernity and respond to scientific notions and their often harmful technological and industrial offspring, as well as incorporate the beauty of their insights as found in the ideas of evolution and quantum theory. Thomas Berry, who died in 2009, often cited by Taylor as expressing the core ideas of deep green religion, was a practicing Roman Catholic priest with a prophetic voice willing to name and criticize the status quo. The book pays scant attention to the Forum on Religion and Ecology's project of retrieval, review and reinterpretation of traditional religious ideas in light of the ecological crisis. One compelling project undertaken by the Forum, the film documentary Renewal, shows multiple cases of mosques, temples, churches and synagogues actively putting green initiatives into practice. Though Taylor would seemingly prefer to see environmental ethics as a Pagan endeavor outside the mainstream, religious leaders worldwide, from mullahs to swamis, to rabbis and priests and ministers, have been engaged in green work for decades. Despite this oversight, Taylor makes a good case that the knowledge of scientists and the inspiration of poets can help people overcome their distance from the natural order and that individuals can learn to chart a more Earth-friendly course.